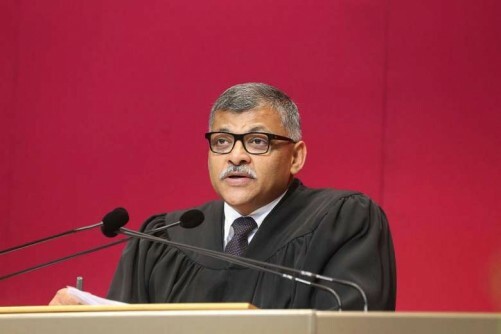 Long-time lawyers, law academics and newly-minted lawyers alike yesterday welcomed the announcement by Chief Justice Sundaresh Menon that the process of training contracts and retention policies for new lawyers will be reviewed. The formation of a committee to tackle these issues is timely, they said, citing several factors that had to be addressed to tackle the oversupply of new lawyers. 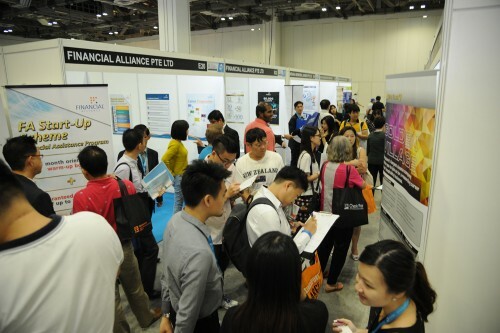 Professor Simon Chesterman, dean of the law faculty at the National University of Singapore (NUS), suggested that one reason for the oversupply of law graduates - some 650 last year - was an increase in the number of Singaporeans studying law overseas. "There are now more Singaporeans studying law in England than in Singapore. It is the students at second-tier English law schools that are finding it hardest to get training contracts," he said. "Though quality was the first consideration, this was one reason why the number of UK Overseas Scheduled Universities was reduced from 18 to 11 last year," he added, referring to the number of British law schools whose graduates qualify to be admitted to the Singapore Bar. 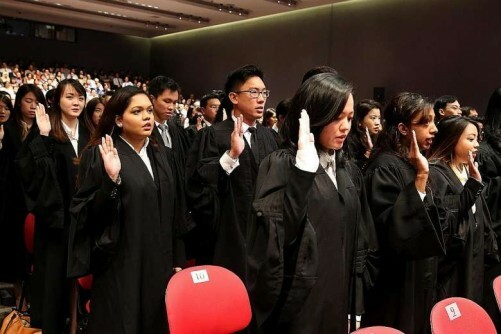 NUS Law School, which accounts for the single largest source of new lawyers here, admits about 250 law students each year, a figure that has stayed constant over a decade. And in spite of challenging conditions, none of last year's graduates reported failing to get a training contract, Prof Chesterman said. 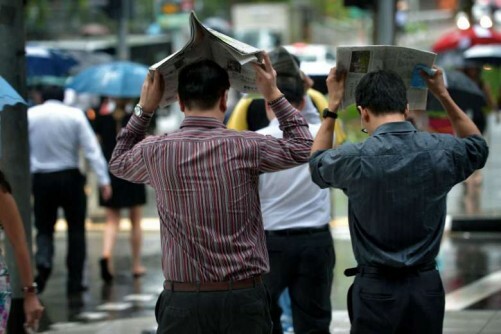 Mr Gary Low, an assistant professor of law at Singapore Management University, welcomed the move to address hiring and retention issues in the legal sector. "I fear that with an oversupply of law graduates there may develop an undesirable attitude of treating new hires that are replaceable at will, rather than potentials to be nurtured," he said. Lawyers interviewed said whether a firm retains a trainee is largely dependent on economic factors. "A fresh graduate lawyer enjoys one of the highest starting salaries, compared to those from other disciplines. If a law firm's current work volume can be handled by five lawyers, the firm will not employ a sixth," said Chia Wong LLP co-managing partner Chia Boon Teck. Veteran lawyer Amolat Singh said it was important to regulate remuneration for trainees so that taking on the extra headcount doesn't become a burden on law firms. He suggested a coordinating agency could be formed to oversee this matter, and help match lawyers to firms and their chosen specialisations. MP Desmond Choo, a member of the Government Parliamentary Committee for Home Affairs and Law, said CJ Menon's call for greater transparency and structure would give aspiring lawyers "greater clarity and parity". "A more structured supervised training regime will also improve our legal standards in a consistent manner across different sizes of firms," said the Tampines GRC MP. New lawyers said they hoped the panel would make hiring and retention more transparent, and help more graduates land good jobs. 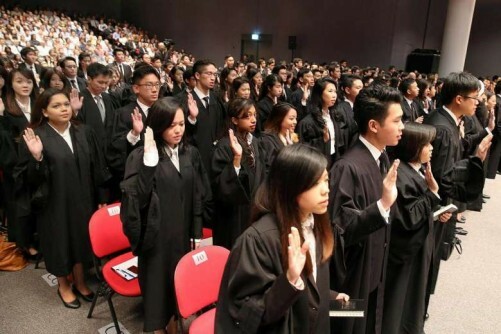 "More transparency is a good thing," said NUS graduate Hui Jun, 24, who was called to the Bar on Friday and knew several trainees who were not retained by their firms. While some had found work with smaller firms, others were still job-hunting and even resorted to looking for jobs outside the sector. NUS law graduate Sherrie Wong, 24, who was also called to the Bar on Friday, said it was also essential that aspiring lawyers be passionate. CJ Menon had made the point that those hoping to join the profession should do so only if they believe in its ideals and the opportunity it afforded to advance justice and serve those who seek it. Said Ms Wong: "It was heartening to hear CJ refer to the legal profession as a calling, and not just a business."